Specially built for the home and workplace, the PRESTIGE is a full-size 7ft American pool table with the looks you would expect from a commercial model. 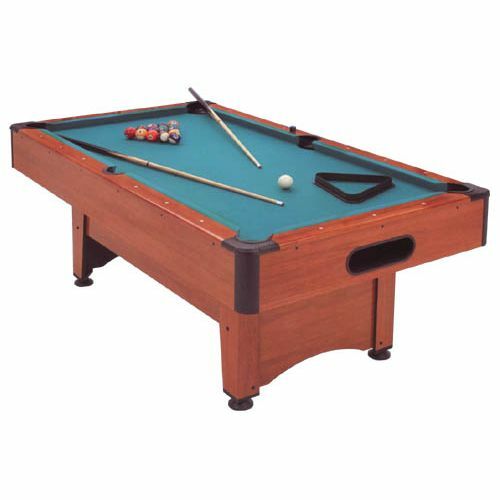 The American pool format gives it slightly larger pockets and balls than the English version but it still has the normal full-size playing surface (6ft x 3ft). Beautifully finished in a maple colour exterior, there are also mother-of-pearl spot inlays on the top surface to help with precision angle shots. The four adjustable feet will cater for any uneven floor surfaces, enabling a smooth and level game every time. All accessories such as cues, balls, triangle and chalk are included. Please note that this table is not coin-operated. Well built and incredible value for money, the PRESTIGE will enhance any games room and bring many years of continued enjoyment. for submitting product review about Prestige American Pool Table.